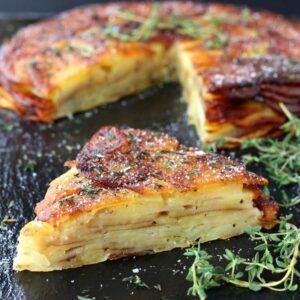 Brown Butter and Thyme Potato Torte is the ONLY way you’re going to want to bring your leftovers for lunch! We cook a lot around our house. I mean like every day we’re making some sort of dinner recipe or appetizer recipe. SO what do we do with ALL the food ALL the time? Well, we eat it usually. What we make is what we eat (and the kids eat) for dinner or lunch or breakfast! 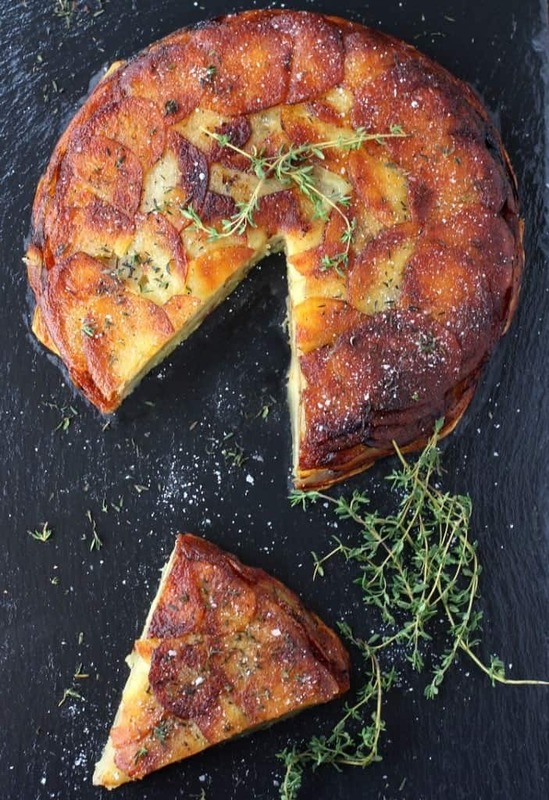 This Brown Butter and Thyme Potato Torte is a perfect example of a side dish for dinner turned into a light lunch the next day. And no need to worry about heating this one up, it’s just as tasty cold, I promise you. What makes this potato torte out of control good is the brown butter combined with the balsamic glaze. We looked at a lot of these torte recipes, sometimes called “Potatoes Anna” and they looked amazing but had TONS of butter. Not that anyone around here is opposed to tons of butter, but we wanted to try and lighten it up a little and that’s where the balsamic glaze comes into play. 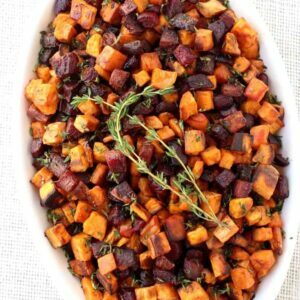 It adds tons of flavor without all the extra calories and it works perfectly in this recipe. We go through so many potatoes in our house, it’s good to know how good they are for you too! Did you know that one potato had more potassium than a banana? Potatoes are an excellent source of Vitamin C too – more than a tomato….and only 110 calories for a medium sized potato. These are all things I did not know, I only knew that I really like eating them. Check out the Potato Goodness website for more information and some other great recipe ideas! So because of all that healthy stuff…we can add just a little butter to this recipe and still come out on top. Start out by slicing 4 pounds of potatoes into about 1/8″ thick slices. If you have a mandoline slicer this will go really fast, or a food processor with a slicing blade will work. Or just a good ol’ sharp knife. This recipe is worth a little slicing, just wait until the end. 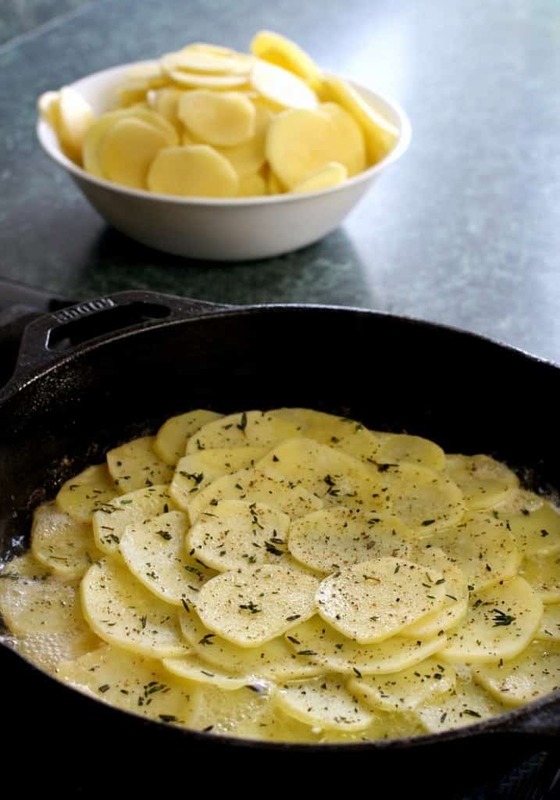 Melt some butter in a 10″ cast iron skillet until it’s bubbling and then start layering in the potato slices in overlapping circles. After you get a couple of layers going, add in some salt and pepper and fresh thyme. Now we’re going to add store bought balsamic glaze to this layer and then keep repeating layers of potatoes and seasonings until you get to the top. Press down slightly with an 8″ cake pan or a small plate and then get the skillet into the oven. Bake for 30 minutes then carefully remove the skillet from the oven and press down with the cake pan again then it goes back in. Another 15 minutes and this Brown Butter and Thyme Potato Torte is done. 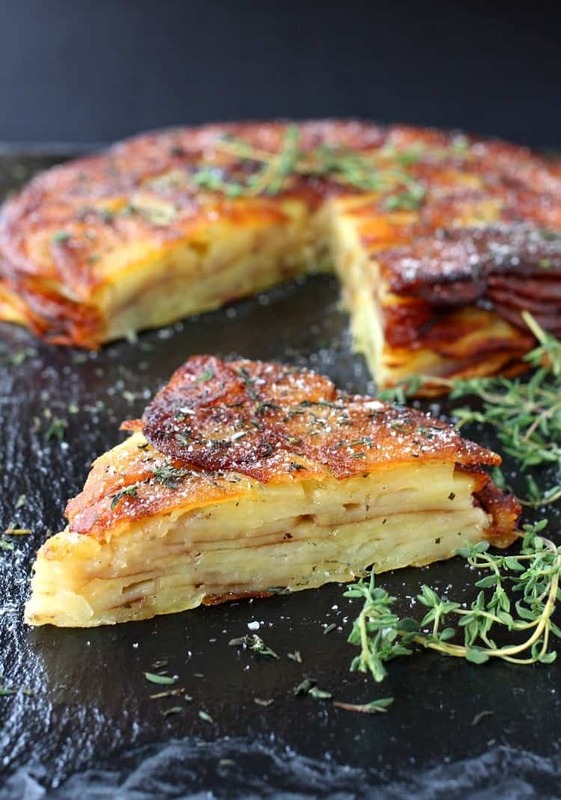 I mean just take a look at all those crispy potato layers! We peeled off all the crunchy top pieces of potato before it even hit the table. Once you taste it you won’t believe there’s only a few tablespoons of butter in the whole recipe. Serve this Brown Butter and Thyme Potato Torte alongside dinner then pack it up for lunch the next day. Or before that, even with your eggs in the morning. So good you can’t stop at one slice! 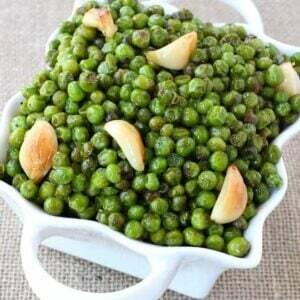 Peel the potatoes then slice on a mandoline into 1/8″ slices. 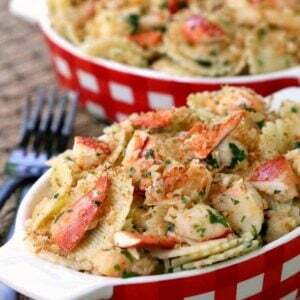 Pour 3 tablespoons of the melted butter in a 10″ cast iron skillet over medium heat. 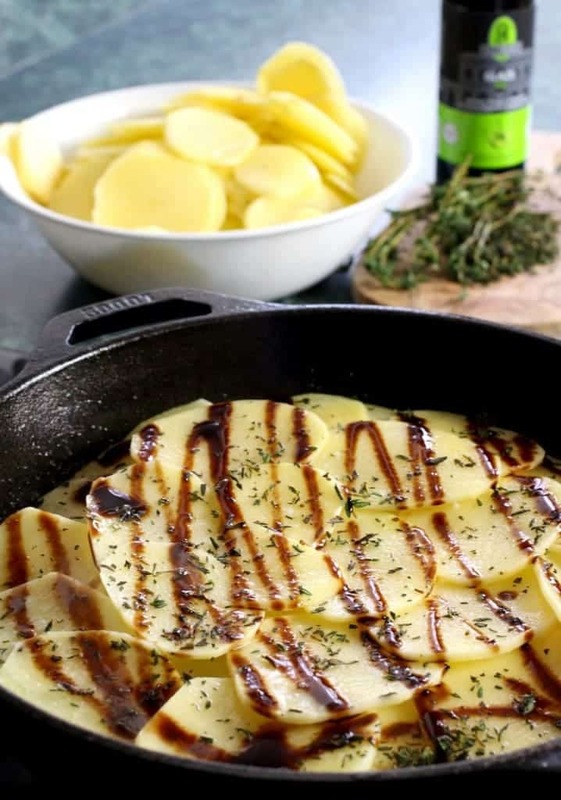 Repeat with the reaming potatoes, glaze, salt, pepper and thyme until you’re done. Press down firmly with an 8″ dinner plate or cake pan and then transfer the skillet to the oven for 30 minutes. Carefully remove the skillet to the stove and press down once again with the cake pan. Return to the oven and cook another 25 minutes. This looks so good! ALL THE CARBS! Thanks Shelly- I think some carbs are definitely worth it! Let me know how you like it Carol! Think this would work with ghee? I can’t do dairy (sad times) but love this recipe! I think it could work yes! Let me know if you try it! Do you think this recipe will freeze well? I think the leftovers would freeze ok but I don’t think it’s a make ahead recipe if that’s what you’re asking.